HAAS Alert conducts its work across public safety, working directly with fleets and municipalities, as well as with the automotive industry to ensure the priorities of both are aligned as cities teeter on the brink of major mobility transformation. Actively engaging both sectors has been in our DNA since day one as we recognized future challenges from the onset. Recently, we have been participating in even more discussions around automotive and what the future holds for connected and autonomous vehicles, challenges and opportunities as it relates to cities as well as public safety – a key area of our focus. Public safety will ultimately underlie a need to weigh in on the future of connected & autonomous vehicles for cities, of which no two are the same -- Recent events have fallen under scrutiny (e.g., Tesla autopilot collision in Culver City and pedestrian Uber death). Public safety officials declared OEMs were becoming negligent in the race for autonomy and were not actively involving public safety leaders, nor considering use cases for emergency and rapid response vehicles. In California for instance, local and state DOT officials along with the mayor of San Francisco held workshops with public safety officials to address concerns around emergency response and Responder safety. There is a big gap at the moment, it’s imperative cities have a cost effective solution in order to share roads with connected and self-driving cars. We are finally starting to observe stakeholders from automotive, public safety, smart city IoT and policy join at the same table. Decisions currently being negotiated at various local and state levels across the country will have tremendous implications for what is ultimately to come at the federal level. Real-time data "at the source" vs. ingested data with "AI/Machine learning" applied are different and is becoming more apparent to cities and public safety officials. Ground truth inputs that can inform and tip-off dangerous incidents as they occur (e.g., an emergency vehicle racing towards a building fire) can trigger a series of events to give potential victims, responders, motorists, pedestrians and bystanders the best possible odds. IoT (Internet of Things) can empower this type of “daisy chain” or it can be entirely useless if politics are allowed to override the impact on outcomes. HAAS Alert has always approached such problems by learning specific problems and addressing use cases rather than blindly applying technology. First Responders are increasingly in need of scalable and effective solutions to address rapidly changing consumer vehicles. There are (some) options available that will also need to provide cost efficiency, reliability and ease of adoption for new and aftermarket retrofitting (70% of fire departments across the Nation are volunteer). Budgets are a major concern for cities if that isn’t painstakingly obvious by now. General “autonomous safety” reports have only been submitted by Waymo (Update August 2018: Now Ford and GM have submitted as well). In that report, there is a section dedicated to public safety. While it’s a positive step, the overall tone presents itself more as a “checkbox” for consideration, a far cry from any attempt to truly engage and enable best case scenarios for First Responders – the ones who put their lives on the line daily for our communities. Onboard vehicle sensors are evolving and will aid in avoiding dangerous collisions with en-route emergency vehicles, however, even at their best, will still only help alleviate last-second collision avoidance – we can do better. There is no question that onboard sensors are major advancements for our vehicles, however, it also begs the question – If autonomous and semi-autonomous cars are only narrowly avoiding major catastrophe with emergency response vehicles, have our roads really gotten any better? At the Autonomous Vehicle guidelines workshop in Washington D.C. in version 3.0, First Responder use cases were finally acknowledged more so than previously and breakout sessions were held for discussion. Version 2.0 of the autonomous guidelines only held a small mention of use cases to address emergency response vehicles, a positive step in the right direction. Added safety features via in-car/vehicle infotainment screens and audio systems is just the beginning. Real-time road safety information will eventually get integrated with vehicle systems to enable driver awareness of the road ahead. For autonomous use cases, data will inform and assist the vehicle itself in taking appropriate action when rapid response vehicles are nearby – an “off-board” sensor. Public Safety is trending "ALL IN" on Cellular – Small cell 5G, Firstnet, etc. Cities are prioritizing cellular above alternatives, particularly DSRC (Dedicated Short Range Communications). 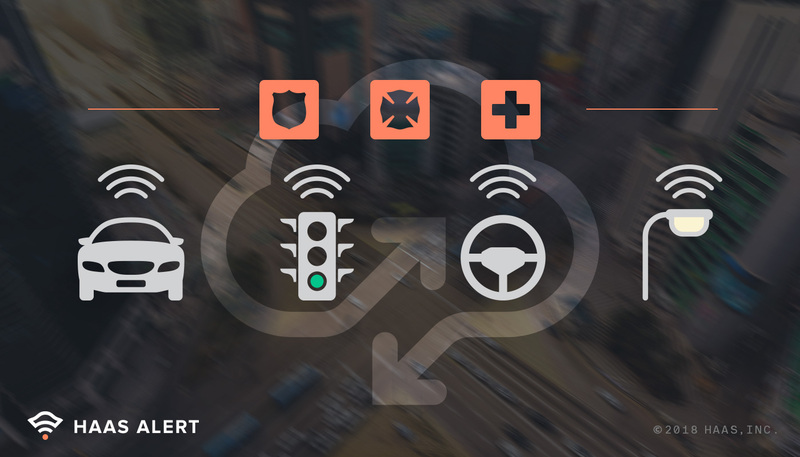 Providing feasible, scalable solutions for connected and retrofit rapid response vehicles, connected traffic signals, connected street lights, etc. The future hinges on cellular enabled applications and IoT. The conversation must not live in a vacuum. Connected "smart" community policy, public safety and connected/autonomous vehicles must figure out how to live in harmony to be able to forge safer, more efficient roads and cities. Cities and municipal agencies, please contact sales@haasalert.com to learn more.